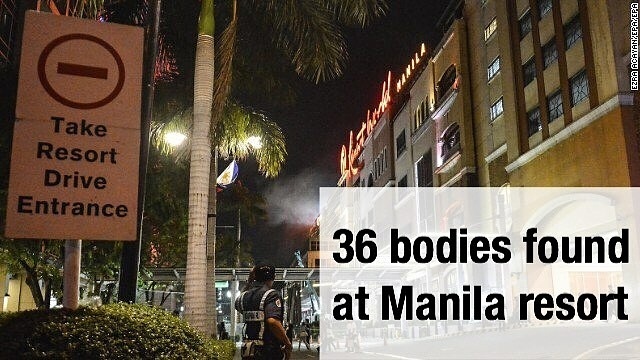 Via UBC News – Authorities in the Philippines say that 36 bodies have been pulled from the Manila World Resort after a shooting on Friday local time. A solo gunman opened fire in the casino early in the morning in an attack that Daesh (IS) claims responsibility for. Officials told the BBC news agency that the shooter set fire to casino tables, causing many to die from suffocation. Police said he set himself on fire after the shooting in an act of suicide. Initial reports from authorities indicated there were no casualties, but bodies were found once the complex was searched. Authorities insisted that the incident was not terror-related, but rather a robbery. An affiliate of Daesh (IS) is active on the southern Filipino island of Mindanao, over 500 km of Manila.